One of the most difficult and enduring challenges business leaders face is misalignment of sales and marketing. Misalignment is another word for trust. When Sales and Marketing don't trust each other it isn't good for either and worse for the company. Brian Beveridge knows how to fix this. Even if you have winning talent and winning solutions, if you can’t get your sales and marketing strategy and execution working seamlessly you’re missing out on money. While these challenges vary some between Enterprise and SMB markets, there are key steps business leaders can take to make substantial impact toward revenue growth. With decades of experience in this arena, Brian has key recommendations for how you can have immediate results to boost sales and crush your competition. 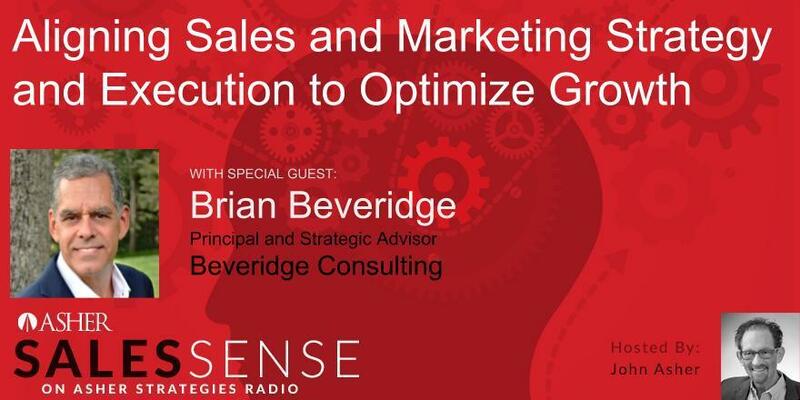 Tune in to “Asher Sales Sense” November 1 at 3PM Eastern on asherstrategiesradio.com to hear John Asher talk with Brian Beveridge of Beveridge Consulting about “Aligning Sales and Marketing Strategy and Execution to Optimize Growth. Beveridge Consulting brings over 30-years of experience spanning sales, marketing and operations management functions at early-stage, mid-market and enterprise organizations interacting on the front-lines with customers, partners and executives to diagnose, recommend and initiate appropriate actions to improve revenue growth and the customer experience across a variety of commercial verticals. We advise B2B/B2B2C commercial companies on how best to align and optimize sales + marketing strategies, resources and execution in order to increase direct and channel-partner revenue through modern, repeatable and measurable actions. From a current-state assessment of sales + marketing strategy, to the execution phases of marketing campaigns and field deployment to sales, we provide the connected-tissue between sales and marketing to bridge the gap in these critical revenue-generating functions so clients can focus on their core competencies. For more than 60 years, Vistage has been bringing together executives in a confidential peer setting where they can candidly discuss operational, financial, legal, structural or even personal challenges. The powerful group dynamic gives each member access to a wealth and diversity of experience and advice dedicated to achieving one another’s success. As a Vistage Chair, I have the privilege of stewarding a private advisory group of successful CEOs, business owners and key executives to help them improve the performance and outcomes of their businesses.